This article is about the rocket. For the fifth moon of Saturn, see Rhea (moon). $185 million in 1969–1971 dollars ($1.16 billion in 2016 value), of which $110 million was for vehicle. The Saturn V (pronounced "Saturn five") was an American human-rated expendable rocket used by NASA between 1967 and 1973. The three-stage liquid-propellant super heavy-lift launch vehicle was developed to support the Apollo program for human exploration of the Moon and was later used to launch Skylab, the first American space station. The Saturn V was launched 13 times from the Kennedy Space Center in Florida with no loss of crew or payload. As of 2019,[update] the Saturn V remains the tallest, heaviest, and most powerful (highest total impulse) rocket ever brought to operational status, and holds records for the heaviest payload launched and largest payload capacity to low Earth orbit (LEO) of 140,000 kg (310,000 lb), which included the third stage and unburned propellant needed to send the Apollo Command/Service Module and Lunar Module to the Moon. The largest production model of the Saturn family of rockets, the Saturn V was designed under the direction of Wernher von Braun and Arthur Rudolph at the Marshall Space Flight Center in Huntsville, Alabama, with Boeing, North American Aviation, Douglas Aircraft Company, and IBM as the lead contractors. To date[update], the Saturn V remains the only launch vehicle to carry humans beyond low Earth orbit. A total of 15 flight-capable vehicles were built, but only 13 were flown. An additional three vehicles were built for ground testing purposes. A total of 24 astronauts were launched to the Moon, three of them twice, in the four years spanning December 1968 through December 1972. The origins of the Saturn V rocket begin with the US government bringing Wernher von Braun along with about seven hundred German rocket engineers and technicians to the United States in Operation Paperclip, a program authorized by President Truman in August 1946 with the purpose of harvesting Germany's rocket expertise, to give the US an edge in the Cold War through development of intermediate-range (IRBM) and intercontinental ballistic missiles (ICBM). It was known that America's rival, the Soviet Union, would also try to secure some of the Germans. Von Braun was put into the rocket design division of the Army due to his prior direct involvement in the creation of the V-2 rocket. Between 1945 and 1958, his work was restricted to conveying the ideas and methods behind the V-2 to the American engineers. Despite Von Braun's many articles on the future of space rocketry, the US Government continued funding Air Force and Navy rocket programs to test their Vanguard missiles in spite of numerous costly failures. It was not until the 1957 Soviet launch of Sputnik 1 atop an R-7 ICBM, capable of carrying a thermonuclear warhead to the US, that the Army and the government started taking serious steps towards putting Americans in space. Finally, they turned to von Braun and his team, who during these years created and experimented with the Jupiter series of rockets. The Juno I was the rocket that launched the first American satellite in January 1958, and part of the last-ditch plan for NACA (the predecessor of NASA) to get its foot in the Space Race. The Jupiter series was one more step in von Braun's journey to the Saturn V, later calling that first series "an infant Saturn". The Saturn program was named Saturn as the planet was the next planet after Jupiter. The Saturn's design stemmed from the designs of the Jupiter series rockets. As the success of the Jupiter series became evident, the Saturn series emerged. Between 1960 and 1962, the Marshall Space Flight Center (MSFC) designed a series of Saturn rockets that could be used for various Earth orbit or lunar missions. The C-1 was developed into the Saturn I, and the C-2 rocket was dropped early in the design process in favor of the C-3, which was intended to use two F-1 engines on its first stage, four J-2 engines for its second stage, and a S-IV stage using six RL10 engines. NASA planned to use the C-3 as part of the Earth Orbit Rendezvous (EOR) concept, with at least four or five launches needed for a single lunar mission. But MSFC was already planning an even bigger rocket, the C-4, which would use four F-1 engines on its first stage, an enlarged C-3 second stage, and the S-IVB, a stage with a single J-2 engine, as its third stage. The C-4 would need only two launches to carry out an EOR lunar mission. On January 10, 1962, NASA announced plans to build the C-5. The three-stage rocket would consist of: the S-IC first stage, with five F-1 engines; the S-II second stage, with five J-2 engines; and the S-IVB third stage, with a single J-2 engine. The C-5 was designed for a 90,000-pound (41,000 kg) payload capacity to the Moon. The C-5 would undergo component testing even before the first model was constructed. The S-IVB third stage would be used as the second stage for the C-IB, which would serve both to demonstrate proof of concept and feasibility for the C-5, but would also provide flight data critical to development of the C-5. Rather than undergoing testing for each major component, the C-5 would be tested in an "all-up" fashion, meaning that the first test flight of the rocket would include complete versions of all three stages. By testing all components at once, far fewer test flights would be required before a manned launch. The C-5 was confirmed as NASA's choice for the Apollo program in early 1963, and was named the Saturn V. The C-1 became the Saturn I, and C-1B became Saturn IB. Von Braun headed a team at the Marshall Space Flight Center in building a vehicle capable of launching a manned spacecraft to the Moon. Before they moved under NASA's jurisdiction, von Braun's team had already begun work on improving the thrust, creating a less complex operating system, and designing better mechanical systems. It was during these revisions that the decision to reject the single engine of the V-2's design came about, and the team moved to a multiple-engine design. The Saturn I and IB reflected these changes, but were not large enough to send a manned spacecraft to the Moon. These designs, however, provided a basis for which NASA could determine its best method towards landing a man on the Moon. The Saturn V's final design had several key features. Engineers determined that the best engines were the F-1s coupled with the new liquid hydrogen propulsion system called J-2, which made the Saturn C-5 configuration optimal. By 1962, NASA had finalized its plans to proceed with von Braun's Saturn designs, and the Apollo space program gained speed. With the configuration finalized, NASA turned its attention to mission profiles. Despite some controversy, a lunar orbit rendezvous for the lunar module was chosen over an Earth orbital rendezvous. Issues such as type of fuel injections, the needed amount of fuel for such a trip, and rocket manufacturing processes were ironed out, and the designs for the Saturn V were selected. The stages were designed by von Braun's Marshall Space Flight Center in Huntsville, and outside contractors were chosen for the construction: Boeing (S-IC), North American Aviation (S-II), Douglas Aircraft (S-IVB), and IBM (Instrument Unit). Early in the planning process, NASA considered three leading ideas for the Moon mission: Earth Orbit Rendezvous, Direct Ascent, and Lunar Orbit Rendezvous (LOR). A direct ascent configuration would require an extremely large rocket to send a three-man spacecraft to land directly on the lunar surface. Earth orbit rendezvous would launch the direct-landing spacecraft in two smaller parts which would combine in Earth orbit. A LOR mission would involve a single rocket launching two spacecraft: a mother ship, and a smaller, two-man landing module which would rendezvous back with the main spacecraft in lunar orbit. The lander would be discarded and the mother ship would return home. NASA at first dismissed LOR as a riskier option, given that a space rendezvous had yet to be performed in Earth orbit, much less in lunar orbit. Several NASA officials, including Langley Research Center engineer John Houbolt and NASA Administrator George Low, argued that a Lunar Orbit Rendezvous provided the simplest landing on the Moon with the most cost–efficient launch vehicle, and the best chance to accomplish the lunar landing within the decade. Other NASA officials were convinced, and LOR was officially selected as the mission configuration for the Apollo program on November 7, 1962. The Saturn V's size and payload capacity dwarfed all other previous rockets successfully flown at that time. With the Apollo spacecraft on top, it stood 363 feet (111 m) tall, and without fins, it was 33 feet (10 m) in diameter. Fully fueled, the Saturn V weighed 6.5 million pounds (2,950,000 kg) and had a low Earth orbit payload capacity originally estimated at 261,000 pounds (118,000 kg), but was designed to send at least 90,000 pounds (41,000 kg) to the Moon. Later upgrades increased that capacity; during the final three Apollo lunar missions it deployed about 310,000 pounds (140,000 kg)[note 1] to LEO and sent up to 107,100 lb (48,600 kg) spacecraft to the Moon. At a height of 363 feet (111 m), the Saturn V was 58 feet (18 m) taller than the Statue of Liberty from the ground to the torch, and 48 feet (15 m) taller than the Big Ben clock tower. In contrast, the Mercury-Redstone Launch Vehicle used on Freedom 7, the first manned American spaceflight, was just under 11 feet (3.4 m) longer than the S-IVB stage, and delivered less sea level thrust (78,000 pounds-force (350 kN)) than the Launch Escape System rocket (150,000 pounds-force (667 kN) sea level thrust) mounted atop the Apollo Command Module. The Saturn V was principally designed by the Marshall Space Flight Center in Huntsville, Alabama, although numerous major systems, including propulsion, were designed by subcontractors. It used the powerful new F-1 and J-2 rocket engines for propulsion. When tested at Stennis Space Center, these engines shattered the windows of nearby houses. Designers decided early on to attempt to use as much technology from the Saturn I program as possible. Consequently, the S-IVB-500 third stage of the Saturn V was based on the S-IVB-200 second stage of the Saturn IB. The Instrument Unit that controlled the Saturn V shared characteristics with that carried by the Saturn IB. Blueprints and other Saturn V plans are available on microfilm at the Marshall Space Flight Center. The Saturn V consisted of three stages—the S-IC first stage, S-II second stage and the S-IVB third stage—and the instrument unit. All three stages used liquid oxygen (LOX) as the oxidizer. The first stage used RP-1 for fuel, while the second and third stages used liquid hydrogen (LH2). Whereas LH2 has a much higher energy density to be lifted into orbit by mass, RP-1 has a much higher energy density by volume. Consequently, RP-1 was chosen for the first stage propellant because the volume of LH2 required would have been more than three times greater and would have created much higher aerodynamic drag during the boost phase through the atmosphere. The upper stages also used small solid-propellant ullage motors that helped to separate the stages during the launch, and to ensure that the liquid propellants were in a proper position to be drawn into the pumps. The S-IC was built by the Boeing Company at the Michoud Assembly Facility, New Orleans, where the Space Shuttle External Tanks would later be built by Lockheed Martin. Most of its mass at launch was propellant, RP-1 fuel with liquid oxygen as the oxidizer. It was 138 feet (42 m) tall and 33 feet (10 m) in diameter, and provided over 7,600,000 pounds-force (34,000 kN) of thrust. The S-IC stage had a dry weight of about 289,000 pounds (131 metric tons) and fully fueled at launch had a total weight of 5,100,000 pounds (2,300 metric tons). It was powered by five Rocketdyne F-1 engines arrayed in a quincunx (five units, with four arranged in a square, and the fifth in the center) The center engine was held in a fixed position, while the four outer engines could be hydraulically turned (gimballed) to steer the rocket. In flight, the center engine was turned off about 26 seconds earlier than the outboard engines to limit acceleration. During launch, the S-IC fired its engines for 168 seconds (ignition occurred about 8.9 seconds before liftoff) and at engine cutoff, the vehicle was at an altitude of about 36 nautical miles (67 km), was downrange about 50 nautical miles (93 km), and was moving about 7,500 feet per second (2,300 m/s). The S-II was built by North American Aviation at Seal Beach, California. Using liquid hydrogen and liquid oxygen, it had five Rocketdyne J-2 engines in a similar arrangement to the S-IC, also using the outer engines for control. The S-II was 81.6 feet (24.87 m) tall with a diameter of 33 feet (10 m), identical to the S-IC, and thus was the largest cryogenic stage until the launch of the Space Shuttle in 1981. The S-II had a dry weight of about 80,000 pounds (36,000 kg) and fully fueled, weighed 1,060,000 pounds (480,000 kg). The second stage accelerated the Saturn V through the upper atmosphere with 1,100,000 pounds-force (4,900 kN) of thrust in vacuum. When loaded, significantly more than 90 percent of the mass of the stage was propellant; however, the ultra-lightweight design had led to two failures in structural testing. Instead of having an intertank structure to separate the two fuel tanks as was done in the S-IC, the S-II used a common bulkhead that was constructed from both the top of the LOX tank and bottom of the LH2 tank. It consisted of two aluminum sheets separated by a honeycomb structure made of phenolic resin. This bulkhead had to insulate against the 126 °F (70 °C) temperature difference between the two tanks. The use of a common bulkhead saved 7,900 pounds (3.6 t). Like the S-IC, the S-II was transported from its manufacturing plant to the Cape by sea. The S-IVB was built by the Douglas Aircraft Company at Huntington Beach, California. It had one J-2 engine and used the same fuel as the S-II. The S-IVB used a common bulkhead to separate the two tanks. It was 58.6 feet (17.86 m) tall with a diameter of 21.7 feet (6.604 m) and was also designed with high mass efficiency, though not quite as aggressively as the S-II. The S-IVB had a dry weight of about 23,000 pounds (10,000 kg) and, fully fueled, weighed about 262,000 pounds (119,000 kg). The S-IVB-500 model used on the Saturn V differed from the S-IVB-200 used as the second stage of the Saturn IB, in that the engine was restartable once per mission. This was necessary as the stage would be used twice during a lunar mission: first in a 2.5 min burn for the orbit insertion after second stage cutoff, and later for the trans-lunar injection (TLI) burn, lasting about 6 min. Two liquid-fueled Auxiliary Propulsion System (APS) units mounted at the aft end of the stage were used for attitude control during the parking orbit and the trans-lunar phases of the mission. The two APSs were also used as ullage engines to settle the propellants in the aft tank engine feed lines prior to the trans-lunar injection burn. The S-IVB was the only rocket stage of the Saturn V small enough to be transported by plane, in this case the Pregnant Guppy. The Instrument Unit was built by IBM and rode atop the third stage. It was constructed at the Space Systems Center in Huntsville, Alabama. This computer controlled the operations of the rocket from just before liftoff until the S-IVB was discarded. It included guidance and telemetry systems for the rocket. By measuring the acceleration and vehicle attitude, it could calculate the position and velocity of the rocket and correct for any deviations. In the event of an abort requiring the destruction of the rocket, the range safety officer would remotely shut down the engines and after several seconds send another command for the shaped explosive charges attached to the outer surfaces of the rocket to detonate. These would make cuts in fuel and oxidizer tanks to disperse the fuel quickly and to minimize mixing. The pause between these actions would give time for the crew to escape using the Launch Escape Tower or (in the later stages of the flight) the propulsion system of the Service module. 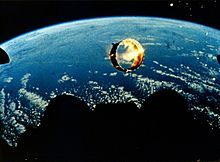 A third command, "safe", was used after the S-IVB stage reached orbit to irreversibly deactivate the self-destruct system. The system was also inactive as long as the rocket was still on the launch pad. The Saturn V had a much lower thrust-to-weight ratio than Project Gemini's Titan II GLV. Richard F. Gordon, Jr. described Saturn as "an old man's ride", with "a lot more shake-rattle-and-roll" but milder thrust. Buzz Aldrin and other Apollo 11 astronauts agreed that they could not tell when Saturn liftoff occurred except from instruments, unlike on Titan. The Soviet space program's counterpart to the Saturn V was Sergei Korolev's N1-L3. The Saturn V was taller, heavier, and had greater payload capacity, both to low Earth orbit and to translunar injection. The N-1 was a three-stage launch vehicle with more liftoff thrust and a larger first stage diameter than the Saturn V. It was to carry the 209,000 lb (95,000 kg) L3 vehicle into orbit. The L3 contained an Earth departure stage, which would send to the Moon a 51,800 lb (23,500 kg) package which contained another stage for lunar orbit insertion and powered descent initiation, a single-cosmonaut lander, and a two-cosmonaut lunar orbiter for the return to Earth. The N1/L3 would have produced more total impulse (product of thrust and time) in its first four stages than the three-stage Saturn V, but it was not able to convert as much of this into payload momentum (product of mass and velocity). The N1 never became operational; four test launches each resulted in catastrophic vehicle failure early in flight, and the program was canceled. Korolev elected to cluster 30 relatively small engines for the first stage, rather than develop a large engine like the Rocketdyne F-1. The three-stage Saturn V grew over its lifetime to a peak thrust of at least 7,650,000 lbf (34,020 kN) (AS-510 and subsequent) and a lift capacity of 310,000 lb (140,000 kg) to LEO. 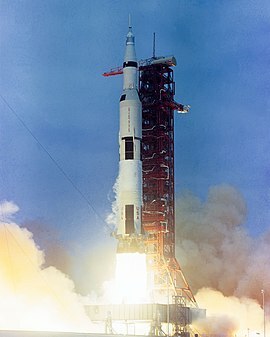 The AS-510 mission (Apollo 15) had a liftoff thrust of 7,823,000 lbf (34,800 kN). The AS-513 mission (Skylab 1) had slightly greater liftoff thrust of 7,891,000 lbf (35,100 kN). By comparison, the N-1 had a sea-level liftoff thrust of about 10,200,000 lbf (45,400 kN). No other operational launch vehicle has ever surpassed the Saturn V in height, weight, total impulse, or payload capability. The closest contenders were the US Space Shuttle and the Soviet Energia. The Space Shuttle generated a peak thrust of 6,800,000 lbf (30,100 kN), and payload capacity to LEO (excluding the Orbiter itself) was 63,500 pounds (28,800 kg), which was about 25 percent of the Saturn V's payload. Total mass in orbit, including the Orbiter, was about 247,000 lb (112,000 kg), compared to the Apollo 15 total orbital mass of the S-IVB third stage and Apollo spacecraft, of 309,771 lb (140,510 kg), some 62,800 lb (28,500 kg) heavier than the Shuttle was rated to carry to LEO. Energia had a liftoff thrust of 7,826,000 lbf (34,810 kN), and flew twice in 1987 and 1988, the second time as the launcher for the Buran shuttle. However, both the Energia and Buran programs were cancelled in 1993. Hypothetical future versions of Energia might have been significantly more powerful than the Saturn V, delivering 10,000,000 lbf (46,000 kN) of thrust and able to deliver up to 386,000 lb (175 t) to LEO in the "Vulkan" configuration. Planned uprated versions of the Saturn V using F-1A engines would have had about 18 percent more thrust and 302,580 pounds (137,250 kg) payload. NASA contemplated building larger members of the Saturn family, such as the Saturn C-8, and also unrelated rockets, such as Nova, but these were never produced. Some other recent US launch vehicles have significantly lower launch capacity to LEO than Saturn V: the US Delta 4 Heavy capacity is 63,470 lb (28,790 kg), the Atlas V 551 has a capacity of 41,478 lb (18,814 kg), and the SpaceX Falcon Heavy has a capacity of 140,700 lb (63,800 kg). The European Ariane 5 ES delivers up to 46,000 lb (21,000 kg) and the Russian Proton-M can launch 49,000 lb (22,000 kg). NASA's Space Launch System, planned for its first flight in 2020, in its final configuration is planned to be 400 feet (120 m) tall with payload, and lift up to 290,000 pounds (130,000 kg) into low Earth orbit. Commonly referenced thrust numbers are a specification, not an actual measurement. Individual stages and engines may fall short or exceed the specification, sometimes significantly. The F-1 thrust specification was uprated beginning with Apollo 15 (SA-510) from 1,500,000 lbf (6,670 kN) to 1,520,000 lbf (6,770 kN), yielding 7,610,000 lbf (33,850 kN) for the S-IC stage. 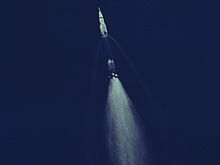 The higher thrust was achieved via a redesign of the injector orifices and a slightly higher propellant mass flow rate. However, comparing the specified number to the actual measured thrust of 7,800,000 lbf (34,800 kN) on Apollo 15 shows a significant difference. There is no way to directly measure thrust of a rocket in flight; Rather, a mathematical calculation is made from combustion chamber pressure, turbopump speed, calculated propellant density and flow rate, nozzle design, and atmospheric pressure. Thrust varies greatly with external pressure and thus with altitude, even for a non-throttled engine. For example, on Apollo 15, the calculated total liftoff thrust (based on actual measurements) was about 7,830,000 lbf (34,810 kN), which increased to 9,200,000 lbf (40,800 kN) at T+135 seconds, just before center engine cutoff (CECO), at which time the jet was heavily underexpanded. Thrust specifications are often given as vacuum thrust (for upper stages) or sea level thrust (for lower stages or boosters), sometimes without qualifying which one. This can lead to incorrect comparisons. Thrust specifications are often given as average thrust or peak thrust, sometimes without qualifying which one. Even for a non-throttled engine at a fixed altitude, thrust can often vary somewhat over the firing period due to several factors. These include intentional or unintentional mixture ratio changes, slight propellant density changes over the firing period, and variations in turbopump, nozzle and injector performance over the firing period. Without knowing the exact measurement technique and mathematical method used to determine thrust for each different rocket, comparisons are often inexact. As the above shows, the specified thrust often differs significantly from actual flight thrust calculated from direct measurements. The thrust stated in various references is often not adequately qualified as to vacuum vs sea level, or peak vs average thrust. Similarly, payload increases are often achieved in later missions independent of engine thrust. This is by weight reduction or trajectory reshaping. The result is there is no single absolute figure for engine thrust, stage thrust or vehicle payload. There are specified values and actual flight values, and various ways of measuring and deriving those actual flight values. The performance of each Saturn V launch was extensively analyzed and a Launch Evaluation Report produced for each mission, including a thrust/time graph for each vehicle stage on each mission. After the construction and ground testing of a stage was completed, it was then shipped to the Kennedy Space Center. The first two stages were so massive that the only way to transport them was by barge. The S-IC, constructed in New Orleans, was transported down the Mississippi River to the Gulf of Mexico. After rounding Florida, it was then transported up the Intra-Coastal Waterway to the Vehicle Assembly Building (originally called the Vertical Assembly Building). This was essentially the same route which would be used later by NASA to ship Space Shuttle External Tanks. The S-II was constructed in California and thus traveled to Florida via the Panama Canal. The third stage and Instrument Unit could be carried by the Aero Spacelines Pregnant Guppy and Super Guppy, but could also have been carried by barge if warranted. On arrival at the Vertical Assembly Building, each stage was inspected in a horizontal position before being moved to a vertical position. NASA also constructed large spool-shaped structures that could be used in place of stages if a particular stage was late. These spools had the same height and mass and contained the same electrical connections as the actual stages. NASA stacked or assembled the Saturn V on a Mobile Launcher Platform (MLP), which consisted of a Launch Umbilical Tower (LUT) with nine swing arms (including the crew access arm), a "hammerhead" crane, and a water suppression system which was activated prior to launch. After assembly was completed, the entire stack was moved from the VAB to the launch pad using the Crawler Transporter (CT). Built by the Marion Power Shovel company (and later used for transporting the smaller and lighter Space Shuttle), the CT ran on four double-tracked treads, each with 57 'shoes'. Each shoe weighed 2,000 pounds (910 kg). This transporter was also required to keep the rocket level as it traveled the 3 miles (4.8 km) to the launch site, especially at the 3 percent grade encountered at the launch pad. The CT also carried the Mobile Service Structure (MSS), which allowed technicians access to the rocket until eight hours before launch, when it was moved to the "halfway" point on the Crawlerway (the junction between the VAB and the two launch pads). Apollo 11 launch pad filmed at 500 fps. The Saturn V carried all Apollo lunar missions. All Saturn V missions were launched from Launch Complex 39 at the John F. Kennedy Space Center in Florida. After the rocket cleared the launch tower, flight control transferred to Johnson Space Center's Mission Control in Houston, Texas. An average mission used the rocket for a total of just 20 minutes. 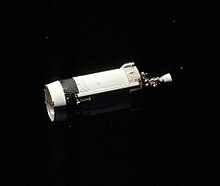 Although Apollo 6 experienced three engine failures, and Apollo 13 one engine shutdown, the onboard computers were able to compensate by burning the remaining engines longer to achieve parking orbit. None of the Saturn V launches resulted in a payload loss. A condensation cloud surrounds the Apollo 11 Saturn V as it works its way through the dense lower atmosphere. See max Q. The first stage burned for about 2 minutes and 41 seconds, lifting the rocket to an altitude of 42 miles (68 km) and a speed of 6,164 miles per hour (2,756 m/s) and burning 4,700,000 pounds (2,100,000 kg) of propellant. At 8.9 seconds before launch, the first stage ignition sequence started. The center engine ignited first, followed by opposing outboard pairs at 300-millisecond intervals to reduce the structural loads on the rocket. When thrust had been confirmed by the onboard computers, the rocket was "soft-released" in two stages: first, the hold-down arms released the rocket, and second, as the rocket began to accelerate upwards, it was slowed by tapered metal pins pulled through dies for half a second. It took about 12 seconds for the rocket to clear the tower. During this time, it yawed 1.25 degrees away from the tower to ensure adequate clearance despite adverse winds. (This yaw, although small, can be seen in launch photos taken from the east or west.) At an altitude of 430 feet (130 m) the rocket rolled to the correct flight azimuth and then gradually pitched down until 38 seconds after second stage ignition. This pitch program was set according to the prevailing winds during the launch month. The four outboard engines also tilted toward the outside so that in the event of a premature outboard engine shutdown the remaining engines would thrust through the rocket's center of mass. The Saturn V reached 400 feet per second (120 m/s) at over 1 mile (1,600 m) in altitude. Much of the early portion of the flight was spent gaining altitude, with the required velocity coming later. The Saturn V broke the sound barrier at just over 1 minute at an altitude of between 3 and 4 nautical miles (5.5 to 7.4 kilometers). At this point, shock collars, or condensation clouds, could be seen forming around the bottom of the command module and around the top of the second stage. At about 80 seconds, the rocket experienced maximum dynamic pressure (max Q). The dynamic pressure on a rocket varies with air density and the square of relative velocity. Although velocity continues to increase, air density decreases so quickly with altitude that dynamic pressure falls below max Q. Acceleration increased during S-IC flight for three reasons. One, increased acceleration increased the propellant pressure at the engines, increasing the flow rate somewhat. This was the least important factor, though this feedback effect often led to an undesirable thrust oscillation called pogo. Two, as it climbed into thinner air F-1 engine efficiency increased significantly, a property of all rockets. The combined thrust of five engines on the pad was about 7.5 million pounds, reaching nearly 9 million pounds at altitude. But the biggest contribution by far was the rocket's rapidly decreasing mass. The propellant in just the S-IC made up about three-quarters of Saturn V's entire launch mass, and it was furiously consumed at over 13 metric tonnes per second. Newton's second law states that force is equal to mass multiplied by acceleration, or equivalently that acceleration is equal to force divided by mass, so as the mass decreased (and the force increased somewhat), acceleration rose. Including gravity, launch acceleration was only 1¼ g, i.e., the astronauts felt 1¼ g while the rocket accelerated vertically at ¼ g. As the rocket rapidly lost mass, total acceleration including gravity increased to nearly 4 g at T+135 seconds. At this point, the inboard (center) engine was shut down to prevent acceleration from increasing beyond 4 g.
When oxidizer or fuel depletion was sensed in the suction assemblies, the remaining four outboard engines were shut down. First stage separation occurred a little less than one second after this to allow for F-1 thrust tail-off. Eight small solid fuel separation motors backed the S-IC from the rest of the vehicle at an altitude of about 36 nautical miles (67 km). The first stage continued ballistically to an altitude of about 59 nautical miles (109 km) and then fell in the Atlantic Ocean about 300 nautical miles (560 km) downrange. The engine shutdown procedure was changed for the launch of Skylab to avoid damage to the Apollo Telescope Mount. Rather than shutting down all four outboard engines at once, they were shut down two at a time with a delay to reduce peak acceleration further. After S-IC separation, the S-II second stage burned for 6 minutes and propelled the craft to 109 miles (175 km) and 15,647 mph (6,995 m/s), close to orbital velocity. For the first two unmanned launches, eight solid-fuel ullage motors ignited for four seconds to give positive acceleration to the S-II stage, followed by start of the five J-2 engines. For the first seven manned Apollo missions only four ullage motors were used on the S-II, and they were eliminated completely for the final four launches. About 30 seconds after first stage separation, the interstage ring dropped from the second stage. This was done with an inertially fixed attitude so that the interstage, only 1 meter from the outboard J-2 engines, would fall cleanly without hitting them, as the interstage could have potentially damaged two of the J-2 engines if it was attached to the S-IC. Shortly after interstage separation the Launch Escape System was also jettisoned. See Apollo abort modes for more information about the various abort modes that could have been used during a launch. Apollo 6 interstage falling away. The engine exhaust from the S-II stage glows as it impacts the interstage. About 38 seconds after the second stage ignition the Saturn V switched from a preprogrammed trajectory to a "closed loop" or Iterative Guidance Mode. The Instrument Unit now computed in real time the most fuel-efficient trajectory toward its target orbit. If the Instrument Unit failed, the crew could switch control of the Saturn to the Command Module's computer, take manual control, or abort the flight. About 90 seconds before the second stage cutoff, the center engine shut down to reduce longitudinal pogo oscillations. At around this time, the LOX flow rate decreased, changing the mix ratio of the two propellants, ensuring that there would be as little propellant as possible left in the tanks at the end of second stage flight. This was done at a predetermined delta-v.
Five level sensors in the bottom of each S-II propellant tank were armed during S-II flight, allowing any two to trigger S-II cutoff and staging when they were uncovered. One second after the second stage cut off it separated and several seconds later the third stage ignited. Solid fuel retro-rockets mounted on the interstage at the top of the S-II fired to back it away from the S-IVB. The S-II impacted about 2,300 nautical miles (4,200 km) from the launch site. On the Apollo 13 mission, the inboard engine suffered from major pogo oscillation, resulting in an early automatic cutoff. To ensure sufficient velocity was reached, the remaining four engines were kept active for longer than planned. A pogo suppressor was fitted to later Apollo missions to avoid this, though the early engine 5 cutoff remained to reduce g-forces. Unlike the two-plane separation of the S-IC and S-II, the S-II and S-IVB stages separated with a single step. Although it was constructed as part of the third stage, the interstage remained attached to the second stage. During Apollo 11, a typical lunar mission, the third stage burned for about 2.5 minutes until first cutoff at 11 minutes 40 seconds. At this point it was 1,430 nautical miles (2,650 km) downrange and in a parking orbit at an altitude of 103.2 nautical miles (191.1 km) and velocity of 17,432 mph (7,793 m/s). The third stage remained attached to the spacecraft while it orbited the Earth one and a half times while astronauts and mission controllers prepared for translunar injection (TLI). This parking orbit was quite low by Earth orbit standards, and it would have been short-lived due to aerodynamic drag. This was not a problem on a lunar mission because of the short stay in the parking orbit. The S-IVB also continued to thrust at a low level by venting gaseous hydrogen, to keep propellants settled in their tanks and prevent gaseous cavities from forming in propellant feed lines. This venting also maintained safe pressures as liquid hydrogen boiled off in the fuel tank. This venting thrust easily exceeded aerodynamic drag. For the final three Apollo flights, the temporary parking orbit was even lower (approximately 93 nautical miles (172 km)), to increase payload for these missions. The Apollo 9 Earth orbit mission was launched into the nominal orbit consistent with Apollo 11, but the spacecraft were able to use their own engines to raise the perigee high enough to sustain the 10-day mission. The Skylab was launched into a quite different orbit, with a 234-nautical-mile (434 km) perigee which sustained it for six years, and also a higher inclination to the equator (50 degrees versus 32.5 degrees for Apollo). On Apollo 11, TLI came at 2 hours and 44 minutes after launch. The S-IVB burned for almost six minutes giving the spacecraft a velocity close to the Earth's escape velocity of 25,053 mph (11,200 m/s). This gave an energy-efficient transfer to lunar orbit, with the Moon helping to capture the spacecraft with a minimum of CSM fuel consumption. About 40 minutes after TLI the Apollo Command Service Module (CSM) separated from the third stage, turned 180 degrees and docked with the Lunar Module (LM) that rode below the CSM during launch. The CSM and LM separated from the spent third stage 50 minutes later. This process is known as Transposition, docking, and extraction. If it were to remain on the same trajectory as the spacecraft, the S-IVB could have presented a collision hazard so its remaining propellants were vented and the auxiliary propulsion system fired to move it away. For lunar missions before Apollo 13, the S-IVB was directed toward the Moon's trailing edge in its orbit so that the Moon would slingshot it beyond earth escape velocity and into solar orbit. From Apollo 13 onwards, controllers directed the S-IVB to hit the Moon. Seismometers left behind by previous missions detected the impacts, and the information helped map the interior structure of the Moon. On September 3, 2002, astronomer Bill Yeung discovered a suspected asteroid, which was given the discovery designation J002E3. It appeared to be in orbit around the Earth, and was soon discovered from spectral analysis to be covered in white titanium dioxide, which was a major constituent of the paint used on the Saturn V. Calculation of orbital parameters led to tentative identification as being the Apollo 12 S-IVB stage. Mission controllers had planned to send Apollo 12's S-IVB into solar orbit after separating from the Apollo spacecraft, but it is believed the burn lasted too long, and hence did not send it close enough to the Moon, remaining in a barely stable orbit around the Earth and Moon. In 1971, through a series of gravitational perturbations, it is believed to have entered in a solar orbit and then returned into weakly captured Earth orbit 31 years later. It left Earth orbit again in June 2003. In 1965, the Apollo Applications Program (AAP) was created to look into science missions that could be performed using Apollo hardware. Much of the planning centered on the idea of a space station. Wernher von Braun's earlier (1964) plans employed a "wet workshop" concept, with a spent S-II Saturn V second stage being launched into orbit and outfitted in space. The next year AAP studied a smaller station using an S-IVB Saturn 1B second stage. By 1969, Apollo funding cuts eliminated the possibility of procuring more Apollo hardware, and in fact forced the cancellation of some later Moon landing flights. This freed up at least one Saturn V, allowing the wet workshop to be replaced with the "dry workshop" concept: the station (now known as Skylab) would be built on the ground from a surplus Saturn IB second stage and launched atop the first two live stages of a Saturn V. A backup station, constructed from a Saturn V third stage, was built and is now on display at the National Air and Space Museum. Skylab was the only launch not directly related to the Apollo lunar landing program. 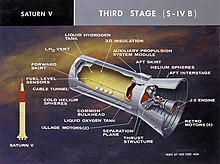 The only significant changes to the Saturn V from the Apollo configurations involved some modification to the S-II to act as the terminal stage for inserting the Skylab payload into Earth orbit, and to vent excess propellant after engine cutoff so the spent stage would not rupture in orbit. The S-II remained in orbit for almost two years, and made an uncontrolled re-entry on January 11, 1975. Three crews lived aboard Skylab from May 25, 1973 to February 8, 1974, with Skylab remaining in orbit until July 11, 1979. After Apollo, the Saturn V was planned to be the prime launch vehicle for Prospector intended to land a 330-kilogram (730 lb) robotic rover on the Moon, similar to the Soviet Lunokhod, and the Voyager Mars probes, as well a scaled-up version of the Voyager interplanetary probes. It was also to have been the launch vehicle for the nuclear rocket stage RIFT test program and the later NERVA. All of these planned uses of the Saturn V were cancelled, with cost being a major factor. Edgar Cortright, who had been director of NASA Langley, stated decades later that "JPL never liked the big approach. They always argued against it. I probably was the leading proponent in using the Saturn V, and I lost. Probably very wise that I lost." The canceled second production run of Saturn Vs would very likely have used the F-1A engine in its first stage, providing a substantial performance boost. Other likely changes would have been the removal of the fins (which turned out to provide little benefit when compared to their weight); a stretched S-IC first stage to support the more powerful F-1As; and uprated J-2s or an M-1 for the upper stages. A number of alternate Saturn vehicles were proposed based on the Saturn V, ranging from the Saturn INT-20 with an S-IVB stage and interstage mounted directly onto an S-IC stage, through to the Saturn V-23(L) which would not only have five F-1 engines in the first stage, but also four strap-on boosters with two F-1 engines each: giving a total of thirteen F-1 engines firing at launch. The Space Shuttle was initially conceived as a cargo transport to be used in concert with the Saturn V, even to the point that a Saturn-Shuttle was proposed, using the winged shuttle orbiter and external tank, but with the tank mounted on a modified, fly-back version of the S-IC. The first S-IC stage would be used to power the Shuttle during the first two minutes of flight, after which the S-IC would be jettisoned (which would then fly back to KSC for refurbishment) and the Space Shuttle Main Engines would then fire and place the orbiter into orbit. The Shuttle would handle space station logistics, while Saturn V would launch components. Lack of a second Saturn V production run killed this plan and left the United States without a heavy-lift launch vehicle. Some in the U.S. space community came to lament this situation, as continued production would have allowed the International Space Station, using a Skylab or Mir configuration with both U.S. and Russian docking ports, to have been lifted with just a handful of launches. The Saturn-Shuttle concept also would have eliminated the Space Shuttle Solid Rocket Boosters that ultimately precipitated the Challenger accident in 1986. From 1964 until 1973, $6.417 billion (equivalent to $34.4 billion in 2018) in total was appropriated for the R&D and flights of the Saturn V, with the maximum being in 1966 with $1.2 billion (equivalent to $7.24 billion in 2018). That same year, NASA received its biggest budget of $4.5 billion, about 0.5 percent of the gross domestic product (GDP) of the United States at that time. One of the main reasons for the cancellation of the last three Apollo flights was the cost. In the time frame from 1969 to 1971 the cost of launching a Saturn V Apollo mission was $185,000,000–$189,000,000, of which $110 million was for the production of the vehicle (equivalent to $590 million in 2018). Facilities integration Used to check precise fits and test facilities operation on Pad 39A before a flight model was ready. First stage scrapped, second stage converted to S-II-F/D, third stage on display at Kennedy Space Center. All Systems Test First stage used for static test firing at Marshall Space Flight Center. On display at Kennedy Space Center. Apollo 4 November 9, 1967 39A First unmanned, all-up test flight; complete success. Apollo 6 April 4, 1968 39A Second unmanned test flight; J-2 engine problems caused early shutdown of two engines in second stage, and prevented third stage restart. Apollo 12 November 14, 1969 39A Vehicle was struck twice by lightning shortly after liftoff, no serious damage. Precision manned lunar landing, near Surveyor 3 at Ocean of Storms. Apollo 13 April 11, 1970 39A Severe pogo oscillations in second stage caused early center engine shutdown; guidance compensated by burning remaining engines longer. Third manned lunar landing mission was aborted by Service Module failure. Apollo 14 January 31, 1971 39A Third manned lunar landing, near Fra Mauro, Apollo 13's intended landing site. Apollo 15 July 26, 1971 39A Fourth manned lunar landing, at Hadley–Apennine. First extended Apollo mission, carrying lunar orbital Scientific Instrument Module and Lunar Roving Vehicle. Apollo 16 April 16, 1972 39A Fifth manned lunar landing, at Descartes Highlands. Apollo 17 December 7, 1972 39A Only night launch. Sixth and final manned lunar landing, at Taurus–Littrow. Skylab 1 May 14, 1973 39A Unmanned launch of the Skylab orbital workshop, which replaced the third stage, S-IVB-513, on display at Johnson Space Center. Originally designated for canceled Apollo 18. Unused Originally designated for canceled Apollo 19; never used. First stage (S-IC-14) on display at Johnson Space Center, second and third stage (S-II-14, S-IV-14) on display at Kennedy Space Center. Unused Originally designated for Apollo 20, later as a backup Skylab launch vehicle; never used. The first stage was on display at Michoud Assembly Facility, until June 2016 then was moved to the INFINITY Science Center in Mississippi. The second stage (S-II-15) is on display at Johnson Space Center. The third stage was converted to a backup Skylab orbital workshop and is on display at the National Air and Space Museum. Comparison of maximum payload to low Earth orbit (LEO) (Left to right). Space Shuttle payload includes 7 crew and cargo. Ares I payload includes 4 crew and inherent craft. Saturn V payload includes 3 crew, inherent craft and cargo. Ares V payload includes only cargo and inherent craft. The Saturn V was capable of lifting approximately 140 metric tons of payload to LEO. The Ares V was being designed to lift 188 metric tons to LEO. U.S. proposals for a rocket larger than the Saturn V from the late 1950s through the early 1980s were generally called Nova. Over thirty different large rocket proposals carried the Nova name, but none was developed. Wernher von Braun and others also had plans for a rocket that would have featured eight F-1 engines in its first stage, like the Saturn C-8, allowing a direct ascent flight to the Moon. Other plans for the Saturn V called for using a Centaur as an upper stage or adding strap-on boosters. These enhancements would have enabled the launch of large robotic spacecraft to the outer planets or send astronauts to Mars. Other Saturn-V derivatives analyzed included the Saturn MLV family of "Modified Launch Vehicles", which would have almost doubled the payload lift capability of the standard Saturn V and were intended for use in a proposed mission to Mars by 1980. In 1968, Boeing studied another Saturn-V derivative, the Saturn C-5N, which included a nuclear thermal rocket engine for the third stage of the vehicle. The Saturn C-5N would carry a considerably greater payload to interplanetary destinations. Work on the nuclear engines, along with all Saturn V ELVs, was ended in 1973. In 2006, as part of the proposed Constellation Program, NASA unveiled plans to construct two Shuttle Derived Launch Vehicles, the Ares I and Ares V, which would use some existing Space Shuttle and Saturn V hardware and infrastructure. The two rockets were intended to increase safety by specializing each vehicle for different tasks, Ares I for crew launches and Ares V for cargo launches. The original design of the heavy-lift Ares V, named in homage to the Saturn V, was 360 ft (110 m) in height and featured a core stage based on the Space Shuttle External Tank, with a diameter of 28 ft (8.4 m). It was to be powered by five Space Shuttle Main Engines (SSMEs) and two five-segment Space Shuttle Solid Rocket Boosters (SRBs). As the design evolved, the SSMEs were replaced with five RS-68 engines, the same engines used on the Delta IV. The switch from the SSME to the RS-68 was intended to reduce cost, the RS-68 being cheaper, simpler to manufacture, and more powerful than the SSME, though the lower efficiency of the RS-68 required an increase in core stage diameter to 33 ft (10 m), the same diameter as the Saturn V's S-IC and S-II stages. In 2008, NASA again redesigned the Ares V, lengthening the core stage, adding a sixth RS-68 engine, and increasing the SRBs to 5.5 segments each. This vehicle would have been 381 ft (116 m) tall and would have produced a total thrust of approximately 8,900,000 lbf (40 MN) at liftoff, more than the Saturn V or the Soviet Energia, but less than the Soviet N-1. Projected to place approximately 180 metric tons into orbit, the Ares V would have surpassed the Saturn V in payload capability. An upper stage, the Earth Departure Stage, would have utilized a more advanced version of the J-2 engine, the J-2X. Ares V would have placed the Altair lunar landing vehicle into low Earth orbit. An Orion crew vehicle launched on Ares I would have docked with Altair, and the Earth Departure Stage would then send the combined stack to the Moon. After the cancellation of the Constellation Program – and hence Ares I and Ares V – NASA announced the Space Launch System (SLS) heavy-lift launch vehicle for deep-space exploration. 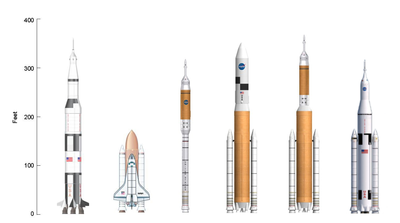 The SLS, similar to the original Ares V concept, will be powered by four SSMEs and two five-segment SRBs. Its Block I configuration will lift approximately 70 metric tons to low Earth orbit. Block IB will add a second stage, the Exploration Upper Stage, powered by four RL10 engines, to increase payload to LEO and deep space. An eventual Block II variant will upgrade to advanced boosters, increasing LEO payload to at least 130 metric tons. NASA SLS deputy project manager Jody Singer of the Marshall Space Flight Center in Huntsville, in 2012 stated that the vehicle will have a launch cost of approximately $500 million per launch, with a relatively minor dependence of costs on launch capability. SA-500D is on horizontal display made up of S-IC-D, S-II-F/D and S-IVB-D. These were all test stages not meant for flight. This vehicle was displayed outdoors from 1969 to 2007, was restored, and is now displayed in the Davidson Center for Space Exploration. Vertical display (replica) built in 1999 located in an adjacent area. One at the Johnson Space Center made up of first stage from SA-514, the second stage from SA-515 and the third stage from SA-513 (replaced for flight by the Skylab workshop). With stages arriving between 1977 and 1979, this was displayed in the open until its 2005 restoration when a structure was built around it for protection. This is the only display Saturn consisting entirely of stages intended to be launched. One at the Kennedy Space Center Visitor Complex, made up of S-IC-T (test stage) and the second and third stages from SA-514. It was displayed outdoors for decades, then in 1996 was enclosed for protection from the elements in the Apollo/Saturn V Center. The S-IC stage from SA-515 is on display at the Infinity Science Center in Mississippi. The S-IVB stage from SA-515 was converted for use as a backup for Skylab, and is on display at the National Air and Space Museum in Washington, D.C.. 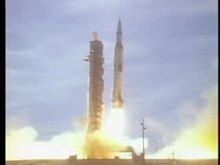 Launch of Apollo 15: T-30s through T+40s. Footage of the Apollo 17 launch was used in the film Apollo 18 to represent the fictional mission. The design of the Saturn V was used as the launch vehicle in the 2014 film Interstellar. In this use the third stage and command module was replaced with the Ranger space craft. This was done to show use of old technology in an all out effort to save humanity. ^ a b c "Apollo Program Budget Appropriations". NASA. Retrieved January 16, 2008. ^ a b "SP-4221 The Space Shuttle Decision- Chapter 6: Economics and the Shuttle". NASA. Retrieved 2011-01-15. ^ a b c d e "Ground Ignition Weights". NASA.gov. Retrieved November 8, 2014. ^ "NASA's Mighty Saturn V Moon Rocket Explained (Infographic)". ^ "V-1 and V-2 Rockets". IEEE Global History Network. Retrieved November 13, 2010. ^ "Wernher von Braun". earthobservatory.nasa.gov. 2001-05-02. Retrieved 2019-04-02. ^ Marov, Welsey T. Huntress, Mikhail Ya. The Soviet Robots in the Solar System. New York, NY: Gardners Books. p. 36. ISBN 1-4419-7897-6. ^ "The Dawn of the Space Age". cia.gov. ^ a b c d e f g Roger E. Bilstein (1996). Stages to Saturn: A Technological History of the Apollo/Saturn Launch Vehicles. NASA SP-4206. ISBN 0-16-048909-1. ^ Robin Williams. "Wernher von Braun (1912–1977)". NASA. Retrieved November 13, 2010. ^ "Saturn the Giant by Wernher von Braun". history.msfc.nasa.gov. Retrieved 2019-04-03. ^ a b c d e f Bilstein, Roger E. (1999). Stages to Saturn: A Technological History of the Apollo/Saturn Launch Vehicle. DIANE Publishing. pp. 59–61. ISBN 978-0-7881-8186-3. Retrieved February 4, 2008. ^ Edgar M. Cortright, ed. (1975). "3.4". Apollo Expeditions to the Moon. NASA Langley Research Center. ISBN 978-9997398277. Retrieved February 11, 2008. ^ a b "Saturn V Moon Rocket". Boeing. Archived from the original on November 20, 2010. Retrieved November 14, 2010. ^ Edgar M. Cortright, ed. (1975). "3.2". Apollo Expeditions to the Moon. NASA Langley Research Center. ISBN 978-9997398277. Retrieved February 11, 2008. ^ NASA,Saturn V Payload Planners Guide, November 1965. ^ "Bong! Big Ben rings in its 150th anniversary". Associated Press. May 29, 2009. Archived from the original on May 31, 2009. Retrieved June 1, 2009. ^ The Apollo LES fired for a much shorter time than the Mercury-Redstone (3.2 seconds vs. 143.5 seconds); thus the Redstone still delivered a much greater total impulse of 11,193,000 pound-seconds (50,225 kN·s), versus 470,400 pound-seconds (2,080 kN·s) for the Apollo LES. Duncan, John (2002). "Apollo Spacecraft News Reference: Launch Escape System". The Apollo Saturn Reference Page. ^ "Stennis Space Center Celebrates 40 Years of Rocket Engine Testing". NASA. April 20, 2006. Retrieved January 16, 2008. ^ Paine, Michael (March 13, 2000). "Saturn 5 Blueprints Safely in Storage". Space.com. Archived from the original on August 18, 2010. Retrieved November 9, 2011. ^ Bilstein, Roger E. (1999). Stages to Saturn: A Technological History of the Apollo/Saturn Launch Vehicle. Diane Publishing. p. 192. ISBN 9780788181863. ^ "Rocket Motor, Solid Fuel, Ullage, Also Designated TX-280". Smithsonian. Retrieved December 4, 2018. ^ a b Lennick, Michael (2006). Launch vehicles : heritage of the space race. Burlington, Ontario: Apogee Books. p. 46. ISBN 1-894959-28-0. ^ NASA (1968). "Saturn V Flight Manual – SA-503" (PDF). NASA – George C. Marshall Space Flight Center. Retrieved March 28, 2015. § 4. ^ "Saturn S-IVB". apollosaturn. Retrieved November 4, 2011. ^ "Skylab Saturn IB Flight Manual" (PDF). NASA Marshall Spaceflight Center. Retrieved January 16, 2008. ^ Agle, D. C. (September 1998). "Riding the Titan II". Air & Space. ^ Wade, Mark. "Saturn V". Encyclopedia Astronautica. Archived from the original on October 7, 2011. Retrieved January 16, 2008. ^ Wade, Mark. "N1". Encyclopedia Astronautica. Retrieved January 16, 2008. ^ "SP-4206 Stages to Saturn p405". NASA. Retrieved January 16, 2008. ^ Seamans Jr, Robert. C. (2007). Project Apollo: The Tough Decisions (PDF). Washington, D.C.: NASA History Division – Government Printing Office. p. 120. ISBN 978-0-16-086710-1. Retrieved October 28, 2015. ^ Saturn V: Apollo 11 mission, in Orloff, Richard W (2001). Apollo By The Numbers: A Statistical Reference, "Launch Vehicle/Spacecraft Key Facts". NASA. in PDF format. Retrieved on 2008-02-19. Published by Government Reprints Press, 2001, ISBN 1-931641-00-5. ^ "Working Scenario" (PDF). Columbia Accident Investigation Board. Retrieved January 16, 2008. ^ "Apollo 15 Press Kit" (PDF). Washington, D.C.: NASA. July 15, 1971. Release No: 71-119K. Archived from the original (PDF) on July 21, 2011. Retrieved July 14, 2011. ^ Petrovitch, Vassili. "Description of the Energia launcher, its boosters, its central block, its engines". Buran-Energia. Vassili Petrovitch. Retrieved September 18, 2015. ^ Wade, Mark. "Saturn MLV-V-1". Encyclopedia Astronautica. Retrieved January 16, 2008. ^ "Space Launch System: NASA's Giant Rocket Explained (Infographic)". ^ "Saturn V Launch Vehicle Evaluation Report—AS-502 Apollo 6 Mission" (PDF). ^ "NASA Technical Reports Server (NTRS)" (PDF). nasa.gov. ^ "NASA GSFC – Lunar Impact Sites". NASA. Retrieved January 16, 2008. ^ Chodas, Paul; Chesley, Steve (October 9, 2002). "J002E3: An Update". NASA. Retrieved September 18, 2013. ^ Jorgensen, K.; Rivkin, A.; Binzel, R.; Whitely, R.; Hergenrother, C.; Chodas, P.; Chesley, S.; Vilas, F. (May 2003). "Observations of J002E3: Possible Discovery of an Apollo Rocket Body". Bulletin of the American Astronomical Society. 35: 981. Bibcode:2003DPS....35.3602J. ^ Young, Anthony (2008). The Saturn V F-1 Engine: Powering Apollo into History. New York: Springer-Praxis. p. 245. ISBN 978-0-387-09629-2. ^ "Skylab rocket debris falls in Indian Ocean". Chicago Tribune. Jan 11, 1975. Retrieved October 22, 2014. ^ Paolo Ulivi (2004). Lunar Exploration: Human Pioneers and Robotic Surveyors. Springer Science & Business Media. p. 40. ISBN 978-1-85233-746-9. ^ Wade, Mark. "Saturn Genealogy". Encyclopedia Astronautica. Archived from the original on December 26, 2007. Retrieved January 17, 2008. ^ Wade, Mark. "Saturn V-23(L)". Encyclopedia Astronautica. Retrieved January 16, 2008. ^ "Human Space Exploration:The Next 50 Years". Aviation Week. March 14, 2007. Retrieved June 18, 2009. ^ a b c d e f Wright, Mike. "Three Saturn Vs on Display Teach Lessons in Space History". NASA. Retrieved February 10, 2011. ^ https://ntrs.nasa.gov/archive/nasa/casi.ntrs.nasa.gov/19650020081_1965020081.pdf "Modified Launch Vehicle (MLV) Saturn V Improvement Study Composite Summary Report", NASA Marshall Space Flight Center (MSFC), July 1965, p. 76. ^ "Saturn S-N V-25(S)U". Astronautix.com. Retrieved October 14, 2013. ^ Dewar, James (2008). To The End Of The Solar System: The Story Of The Nuclear Rocket (2nd ed.). Apogee. ISBN 978-1-894959-68-1. ^ NASA's Nuclear Frontier The Plum Brook Reactor Facility, pp. 68, 73, 76, 101, 116, 129. ^ John P. Sumrall A New Heavy-Lift Capability for Space Exploration: NASA's Ares V Cargo Launch Vehicle. NASA Through years of triumph and tragedy, direct experience and engineering risk analyses have concluded that separating the crew from the cargo during launch reduces safety risks and improves safety statistics. ^ Phil Sumrall (August 15, 2008). "Ares V Overview" (PDF). p. 4 – Launch Vehicle Comparisons. ^ David S. Weaver (September 14, 2011). "NASA SLS Announcement". ^ Chris Bergin (November 9, 2012). "Dynetics and PWR aiming to liquidize SLS booster competition with F-1 power". NASASpaceFlight.com. Retrieved October 14, 2013. ^ Bilstein, Roger E. (1980). Stages to Saturn. NASA. p. 439. Akens, David S (1971). Saturn illustrated chronology: Saturn's first eleven years, April 1957 – April 1968. NASA – Marshall Space Flight Center as MHR-5. Also available in PDF format. Retrieved on 2008-02-19. Benson, Charles D. and William Barnaby Faherty (1978). Moonport: A history of Apollo launch facilities and operations. NASA. Also available in PDF format. Retrieved on 2008-02-19. Published by University Press of Florida in two volumes: Gateway to the Moon: Building the Kennedy Space Center Launch Complex, 2001, ISBN 0-8130-2091-3 and Moon Launch! : A History of the Saturn-Apollo Launch Operations, 2001 ISBN 0-8130-2094-8. Bilstein, Roger E. (1996). Stages to Saturn: A Technological History of the Apollo/Saturn Launch Vehicle. NASA SP-4206. ISBN 0-16-048909-1. Also available in PDF format. Retrieved on 2008-02-19. Lawrie, Alan (2005). Saturn, Collectors Guide Publishing, ISBN 1-894959-19-1. Orloff, Richard W (2001). Apollo By The Numbers: A Statistical Reference. NASA. Also available in PDF format. Retrieved on 2008-02-19. Published by Government Reprints Press, 2001, ISBN 1-931641-00-5. Final Report – Studies of Improved Saturn V Vehicles and Intermediate Payload Vehicles (PDF). NASA – George C. Marshall Space Flight Center under Contract NAS&-20266. Retrieved on 2008-02-19. Saturn 5 launch vehicle flight evaluation report: AS-501 Apollo 4 mission (PDF). NASA – George C. Marshall Space Flight Center (1968). Retrieved on 2008-02-19. Saturn 5 launch vehicle flight evaluation report: AS-508 Apollo 13 mission (PDF). NASA – George C. Marshall Space Flight Center (1970). Retrieved on 2008-02-19. Saturn V Press Kit. Marshall Space Flight Center History Office. Retrieved on 2008-02-19. ^ a b Serial numbers were initially assigned by the Marshall Space Flight Center in the format "SA-5xx" (for Saturn-Apollo). By the time the rockets achieved flight, the Manned Spacecraft Center started using the format "AS-5xx" (for Apollo-Saturn). Wikimedia Commons has media related to Saturn V.
This page was last edited on 16 April 2019, at 00:20 (UTC).